The first small ancient dog we have explored, the Lhasa Apso of today is a popular lap (& show) dog worldwide. Meet another member of the ancient dog breeds of the world. This squat little breed originated in the Himalayan Mountains of Tibet centuries ago & they are named for the city of Lhasa. Initially their breeding was limited to holy men & nobles and they were used as watchdogs in temples & religious centers. These small animals were considered sacred by the Tibetan people as it was believed that when their master died his soul entered the Lhasa Apso’s earthly body. When it comes to the dog world, there is a lot of terminology to learn & understand. 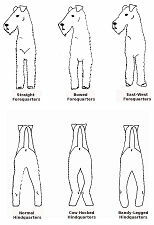 Everything from head & face terms, dog coat types, & ear shape is subject to a long list of types & terminology. Here are some basic definitions to dog leg terminology, we’ve separated them by front & hind end & provided the cheatsheet (click the image for a larger view) to the right for quick visual reference. 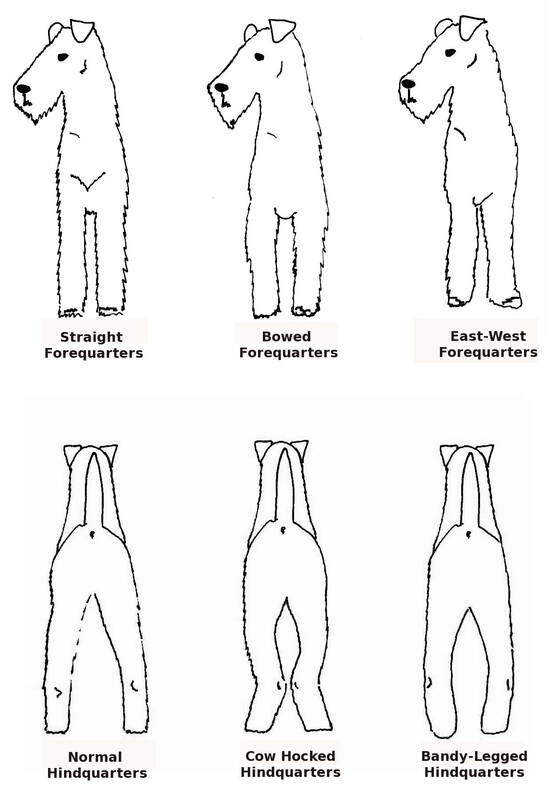 The terms below refer to the front end of the dog or forequarters. When the forelegs curve out between the elbows & pasterns. When the pastern is weak & overly sloped. A large, stocky dog with a big fluff of hair, the Chow Chow’s origins are so old that they are a mystery. Meet another member of the ancient dog breeds of the world. 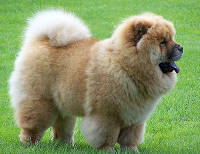 The oldest known dog fossils date back several million years and bear a striking resemblance to the Chow Chow today. 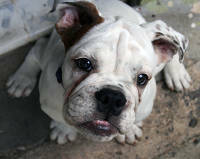 Pictures similar to this breed have been found on Chinese pottery dating back to 206 BC and documentation of their type goes back to the 11th century BC. They may come form similar origins as the Shar-Pei as they share some physical characteristics. This breed is unique in that their hind legs are almost totally straight (giving them a rather lilted looking walk) and their tongues are a shade of purple or blue. This handy post is curtesy of Jillian Interlichia who writes for An Apple a Day. Bringing home a puppy is one of the most exciting events in your, and the puppy’s, life. You’re introducing a new family member into your circle, and it can be a daunting task once you realize that you now are responsible for turning this tiny ball of fur into a well-behaved adult dog. No one can argue – puppies are adorable. They are gangly and uncoordinated, like to chew on everything, and are easily excited. The problem is, all that jumping, barking, and nipping that is cute now will be annoying and possibly dangerous in the future.